Learn how to build a GIS app with React and other open source tools. All the attention geographical information systems (GIS) have gotten in recent years may make you think they are something new. In fact, geospatial data helped play a major role more than 160 years ago in identifying the source of the deadly London cholera outbreak of 1854. Dr. John Snow, a local physician, suspected that contaminated drinking water was the source of the disease. During the investigation, he plotted a density map of cholera cases and interviewed residents in the affected neighborhood to learned about their water use habits. His analysis showed a high number of incidents near a communal water pump. In this article, I'll introduce five modern open source mapping tools, and then help you get started building your first GIS app. Before diving into the tutorial for building your first GIS app—a map of castles in Prague, Czech Republic—let's look at five essential tools that can make your mapping life easier. Fortunately, Create React App comes to the rescue. By taking a "batteries-included" approach, the command-line tool developed by the Facebook React team helps you quickly create a fully functional React app by including all the necessary libraries, starter files, and even a unit test framework. GeoJSON is a human-readable format for describing and sharing GIS data that is widely supported by many geospatial libraries and applications. The GeoJSON.io site is an online sandbox for your GeoJSON data. 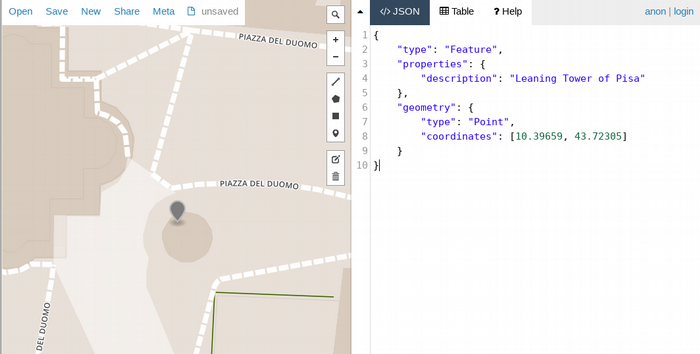 "description": "Leaning Tower of Pisa"
To see how your GeoJSON data would look on a map, visit GeoJSON.io and enter the above code. Heat map of outdoor rock climbing walls in California, USA. Built with Leaflet and Heatmap plugin. Turf.js is a powerful geospatial library to include in your toolbox. You can perform common geospatial functions, such as testing whether a point lies inside a polygon, or do a more complex k-means calculation to prepare your data for a heatmap. OpenStreetMap, founded by Steve Coast in 2004, is the largest collaborative mapping project in the world. Similar to Wikipedia, the platform makes it easy for people like you and me to map the world around us by adding and tagging local roads, highways, buildings, rivers, and so on. These map data, available under an open license, are a goldmine for GIS applications! Our tutorial app will connect directly to OpenStreetMap's REST API servers to get all the castles in Prague. Commercial users can download its "weekly planet file," an export of its entire database, an approximately 40GB data file. Overpass-turbo is an interactive site for trying out queries against the OpenStreetMap database. To see all castles within 10km of Prague's city center, enter the following query, then click Run. Note that the map does not automatically zoom to our search results. You must enter Prague in the search box to center the map. To learn how to build a GIS app, let's create a castles explorer app. Follow the instructions in the Create React App repository to create a working React app. This will generate a new project structure. Note the following two files, as you will need to edit them in the next step. Verify the app is running at http://localhost:3000 in your browser. Next, introduce Leaflet and React-Leaflet to the project. The latter is a wrapper library that enables Leaflet to work as a React component. Locate public/index.html in your project and add a link to leaflet.css as well as some positioning CSS for the main Leaflet div. The map will be rendered inside this div container. The way to make maps in Leaflet is conceptually similar to how layers are used in GIMP or Photoshop. To display custom data, such as point-of-interest markers, add them to a Leaflet layer, then add that layer to the Leaflet map. Your browser should now show the map of Prague! You can zoom and pan the map with your mouse. If you examine the JSON returned from Overpass, you will see a host of information, such as each castle's physical address, name in Czech, Wikipedia article, and more. You can add a popup to show other details when users click on a castle. 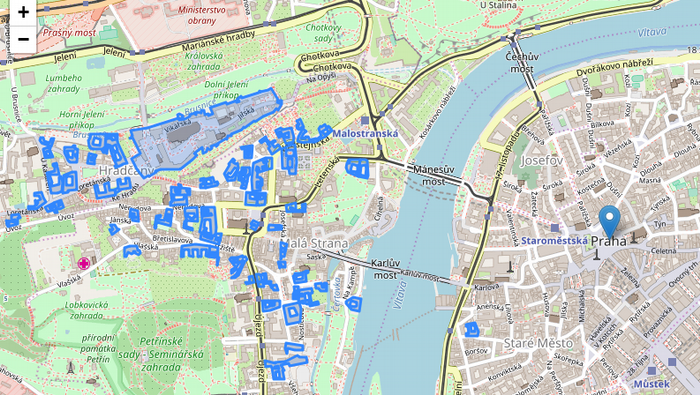 Also, the query is hard-coded to search for castles within a 10km radius of Prague's city center. You can improve the castles component and the query to handle arbitrary latitudes and longitudes, effectively turning the app into a global castle explorer! Viet Nguyen - Viet Nguyen is a rock climber and GIS enthusiast. He's currently a team member of the Kiali project. I changed the lat and lng in MyMap.js - it rendered OK except that only one sixth of the tiles displayed. I tried a second time in a different country to check it was not position related, but the same problem was present. @nobicycle Thanks for checking out the demo app. Can you go to your Browser's developer tools -> Network tab and check if all the .png tile files are loaded without error?